Paya is a municipality in the Colombian Department of Boyacá, part of the the subregion of the La Libertad Province. It was founded on 14 September 1600. 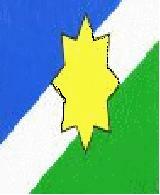 The flag of Paya is diagonally divided blue-white-green and charged with 8 points star.. The flag can be seen, together with the flags of Colombia and Boyacá, on a photograph taken during the "Ruta Libertadora" event. Unfortunately, the star is not visible on the municipal flag.